Just a reminder that we have a class, as usual, on Easter Monday at Woolsery. See you there! The Hartland Aikido Club now has a Facebook page. Hartland Club member, Dermot Hogan, has decided to work on a project to explore ways of dealing with attacks and holds from behind. I don't know quite where this project will lead but I imagine that Dermot may be at least experimenting with a few of the techniques shown in this video. Should be interesting! I think this says it all, really! We are continuing our study of the 1st Ki Aikido Jo Kata or 'jogi' at the Bucks Cross class in North Devon tonight. Over the past year I have been fortunate to have been able to study with Sensei Richard Small in Bideford who teaches the Iwama style of aiki-jo. Previously I have never studied that tradition and it has been a considerable challenge to me. I have come to realise that the Iwama (Saito Sensei) tradition emphasises quite different qualities in its jo work than the Ki (Tohei Sensei) tradition. In my view, both styles are equally worthy of study. Iwama jo work builds power, stability and precision. Ki jo work emphasises lightness, fluidity and speed. Both traditions emphasise softness and centredness. It is rather remarkable that a simple wooden stick has so much to teach! Anyway, for reference, this is the Ki-style jo kata which we are currently studying in the Bucks Cross class. 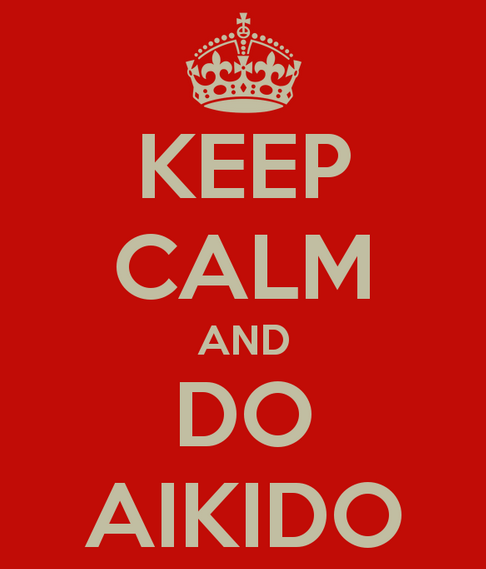 Just a quick reminder that the new Aikido class meets again tomorrow (Monday 4th of March) in the Community Hall in Woolsery (Wolfardisworthy), North Devon. If you live in Bideford or any of the surrounding villages such as Northam, Parkham, Hartland or Clovelly, this is the perfect opportunity to learn a martial art. The Aikido class is small and friendly, it is suitable for women and men, and the Hall is a lovely venue with plenty of parking space and even a bar on site! The class begins at 7:30 in the evening but if you can arrive at about 7:20, that would be appreciated as you can then help us to put out the mats to ensure that the class starts on time. Kendo Nagasaki, Aikido and Me! If you are British and of a 'certain age', you will surely remember the great wrestlers who became household names in the 1970s thanks to the hugely popular bouts televised on Saturday afternoons. Names such as Mick McManus, Jackie Pallo and Adrian Street still cause a thrill of nostalgic excitement. Much to my surprise, I recently discovered that I have something in common with one of the greatest and most famous (or infamous?) of all British wrestlers - the wonderful Kendo Nagasaki.